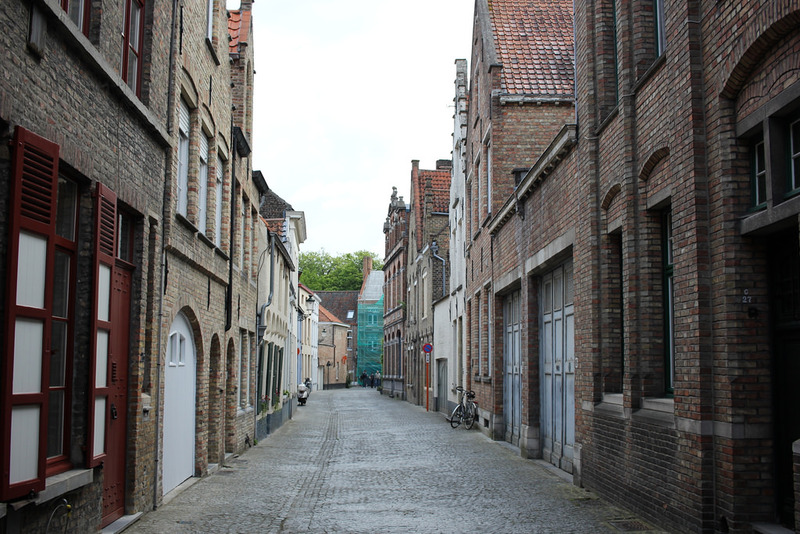 Bruges is the most adorable, fairy-tale like medieval city. It also becomes, during the day, a place packed to the gills with tourists, visitors, travelers, and generally large hordes of people. Slow moving people. For me, Bruges was best at night and early in the day, before the buses and the hordes of people arrived. When I could walk in peace, with the quiet buzz from restaurants as background noise, I was able to bond with this town more. That might sound odd but it’s difficult to get the feel of a place when it’s packed to the gills. Emily and I spent one evening eating frozen yogurt and waffles, which was lovely. One glorious escape came in the form of our trip to the Groeningemuseum, where I got my adrenaline going just thinking about seeing Hieronymous Bosch’s The Last Judgement triptych (three-paneled) piece. We went through every gallery, seeing gorgeous Flemish Madonnas and the most sensitive hands painted but I began to slightly panic. For me, seeing Bosch’s work in person is unlike anything else. I saw his Garden of Earthly Delights at El Prado in Madrid 6 years ago and cried a little for no real tangible reason. Seeing another beautiful triptych of his made me so excited, but alas- the piece is being restored and will not be up until 2016 (insert slew of sad expletives here). Regardless, I was able to see the creepiest devil ever (see above) and get a glimpse of another Bosch piece done by an apprentice of his. It was appropriately bizarre and a bit grotesque. Hey! I’m actually back in the States now- I wasn’t able to blog about any of my adventures while I was making them, ha! My sister and I did not go into any of the chocolate shops…we went into a beautiful one in Delft in the Netherlands! I’m sure you saw some…ahem…interesting molds, ha!